Author: de Camp, L. Sprague Set In . . . Description: Rarely do books have such a great influence on a genre as "Lest Darkness Fall" has had on science fiction. Frequently quoted as one of the ‘favorite’ books of many of the masters of the field, this book by L. Sprague de Camp helped establish time-travel as a solid sub-genre of science fiction. An indication of the influence and longevity of the book is by the number of best-selling writers who have written stories in direct response to, or influenced by, "Lest Darkness Fall." This new volume also includes three such stories by Frederik Pohl, David Drake and S. M. Stirling written over a period of forty-three years—a testament to the timelessness of the book. Similar, thematically, to Mark Twain’s "A Connecticut Yankee in King Arthur’s Court", the book tells the tale of Martin Padway who, as he is walking around in modern Rome, is suddenly transported though time to 6th Century Rome. Once in ancient Rome, Padway (now Martinus Paduei Quastor) embarks on an ambitious project of single-handedly changing history. L. Sprague de Camp was a student of history (and the author of a number of popular works on the subject). 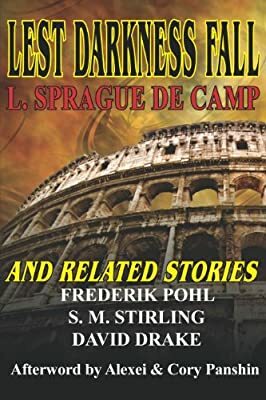 In Lest Darkness Fall he combines his extensive knowledge of the workings of ancient Rome with his extraordinary imagination to create one of the best books of time travel ever written.